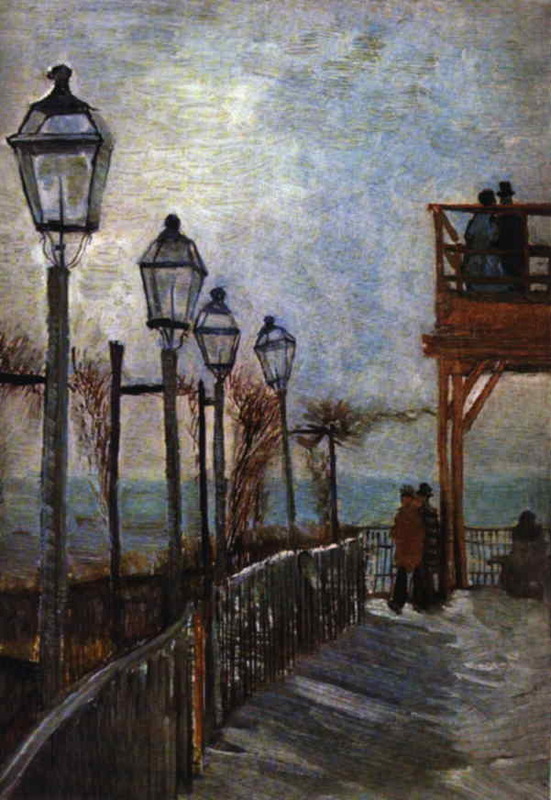 One of the numerous paintings of Montmartre, then still a countrified suburb where Van Gogh shared living quarters with his brother, this picture illustrates both his interest in his new surroundings and also his change of style from dark and heavy tones to light and tender color. From the terrace and observation post of the Moulin de la Galette he suggests not so much a view of the city as the prospect of infinite space. It is surprising to think that only the year before this, back in Nuenen, he had painted in an entirely different key and mood his dusky, lamp-lit peasant genre-scene, The Potato Eaters . His style was not yet finalized (though he could give even the row of lamp-posts a unique individuality). He did not venture to challenge comparison with Monet, Sisley, Renoir and Degas whose work was shown by Theo van Gogh on the Boulevard Montmartre and whom Vincent referred to as `the great impressionists of the Grand Boulevard'. He styled himself one of the `painters of the Petit Boulevard', exhibiting with Bernard, Anquetin, Gauguin and Toulouse-Lautrec at a cafИ on the Boulevard Clichy. Yet in this period of two years before the craving for sunlight and warmth drove him southwards to Arles, it is evident that he was absorbing influences and ideas at a feverish rate. In 1886 the Neo-Impressionism of Seurat and Signac in the last Impressionist exhibition was to be absorbed into his consciousness with extraordinary results.